My Translator is an online database driven system, allowing users to order translations of English into Chinese, or vice versa. While there are automated tools available, such as Google Translate or BabelFish, these tools often produce embarrassingly incorrect translations and are not suitable for professional documents. 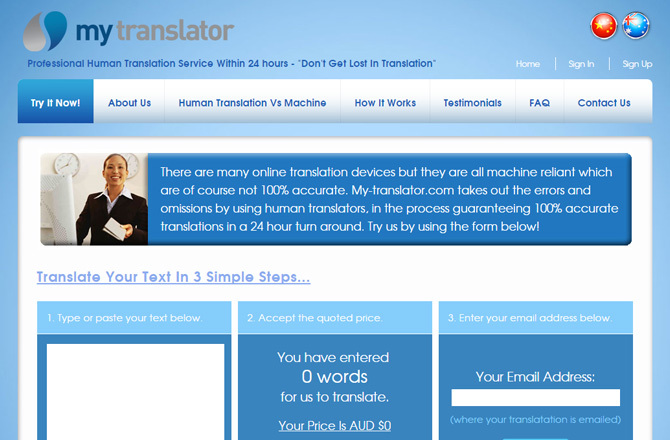 My Translator links users requesting translations with translators from around the world, ensuring that translations are professional, economical and very prompt (normally within 24 hours). The system that drives this engine is complex, handling communications, billings and payments to the translators.